(Jim Mone | The Associated Press) In this Dec. 6, 2012 file photo, Todd Bol poses with a Little Free Library lending boxes in Hudson, Wis. Bol, who founded Little Free Library, the boxes of books for sharing that popped up across the U.S. and spread to more than 80 countries, died Thursday, Oct. 18, 2018, in a Minnesota hospice of complications from pancreatic cancer, according to Little Free Library spokeswoman Margret Aldrich. He was 62. He had an abundance of books, a weathered garage door in need of repair, and an abiding sadness that persisted months after the death of his mother, a schoolteacher who had tutored neighborhood children at the family dining table in their Twin Cities home. And so, in what he later described as "a spiritual gesture" to his late mother, June, Todd Bol set to work one day in 2009. Repurposing wood from his garage, he built a dollhouse-size library in the shape of a one-room schoolhouse, decorating the structure with a steeple and a tinny toy bell. He painted the library red, using bright white paint for its wood- shingled roof, and crafted a glass door to secure a few of his parents' favorite books, including Tom Brokaw's "The Greatest Generation." Then he set the library outside his home in Hudson, Wisconsin, atop a wooden pole with a sign reading "Free Books." And he waited, and watched. "I've always been enthralled by how when a little puppy or kitty walks into a room and the toughest guys can start to be gentle," Bol told The Washington Post in 2013. "I put up my library and noticed my neighbors talking to it like it was a little puppy. And I realized there was some kind of magic about it." Bol, whose streetside memorial provided the inspiration for Little Free Library, a nonprofit organization that he grew into a network of more than 75,000 tiny, whimsical book exchanges that encourage passersby to "take a book, leave a book," died Oct. 18 at a hospice center in Oakdale, Minnesota. He was 62. The cause was complications of pancreatic cancer, said his brother Tony Bol, director of cultural programming at Little Free Library. After Bol’s death, the organization requested that “stewards” — Bol’s term for the guardians and curators of his little athenaeums — tie a silver or white ribbon around the libraries in his honor. There are now Little Free Libraries in all 50 states and in 88 countries, including Australia, Brazil, Ghana, Japan, and the Netherlands. They stand inside Los Angeles police stations and at New York City subway stops, at prisons in Wisconsin and hospitals in Ireland, at a refugee camp in Uganda and a schoolyard in South Sudan. Inside each book exchange are about 20 to 100 volumes, an ever-rotating selection of self-help guides, romance novels, thrillers, how-to manuals, children's books, cookbooks, magazines and whatever else a community decides to donate. Almost all the libraries feature Plexiglass windows and follow design principles developed by Bol, who determined that anything taller than 24 inches would be too big for his station wagon and anything wider than 23 inches would have trouble fitting in a mailing box. Plus, he once told the Minneapolis Star Tribune, "If they get any bigger than that, I hurt my back carrying them." Bol, a self-described “social entrepreneur,” had worked in corporate bartering, nursing education and international development before devoting himself to the library project — an unlikely pursuit, he noted, for someone who had long struggled with dyslexia. He said he began to realize the potential of the little library when his wife hosted a garage sale in 2010, and more people seemed interested in examining his library and discussing its books than in perusing the Bol family's knickknacks. Bol also chose a name for his project, considering the wry title Habitats for the Humanities before settling on Little Free Libraries, and set an ambitious goal for himself. Because steel magnate and philanthropist Andrew Carnegie had built 2,509 libraries, Bol decided, he would build 2,510. 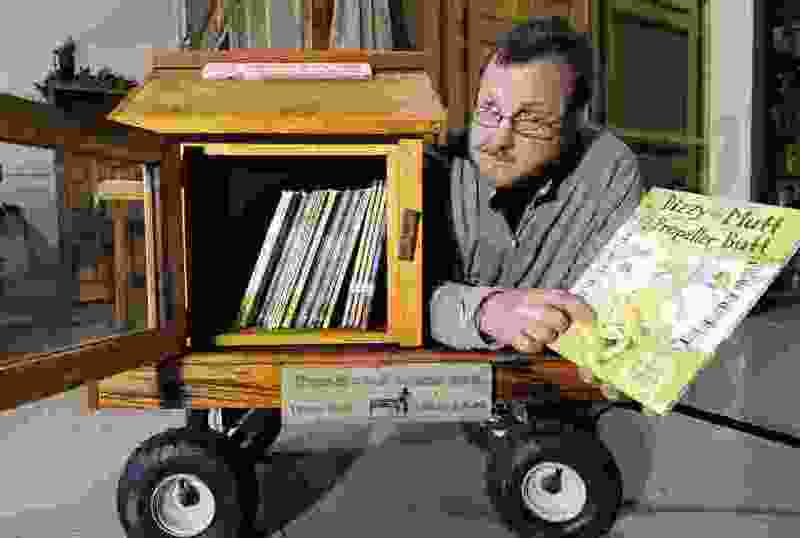 He reached that mark in less than two years, in August 2012, shortly after he and his friend Rick Brooks formally established Little Free Library as a nonprofit organization, with their headquarters not far from Bol's home in Hudson. About 65 percent of the Little Free Library network's boxes are made from scratch, said Margret Aldrich, a spokeswoman with the organization. "Folks have Little Free Libraries shaped like rocket ships, robots, Victorian mansions, black cats, everything under the sun," she said in a phone interview. "One is shaped like a life-size TARDIS, from the television show 'Doctor Who.' Others are done in birchbark by Native American artists. Todd liked to call it a 'folk art revival.' "
For Bol, the eye-catching artistry of the book-exchange boxes was part of what made them appealing. They were designed, he often said, to draw people together, not just to boost literacy and encourage reading. "They are the water cooler of the sidewalk," his brother Tony said in a phone interview. "They give you a reason to stop and talk." The third of five children, Todd Herbert Bol was born in Saint Paul, Minnesota, on Jan. 2, 1956, and raised in nearby Stillwater, along the Wisconsin state line. His father, Richard, was a chiropractor whom Bol later honored with a second Little Free Library outside his home, using wood taken from his childhood bed, grandmother's quilting rack and the family's old kitchen cutting board, according to the Star Tribune. Bol studied at the University of Wisconsin at River Falls, where he received a bachelor's degree in sociology in 1979 and a bachelor's degree in psychology in 1982, and taught at middle schools in the Minneapolis suburbs before leaving to work in corporate bartering with the Minnesota Mining and Manufacturing Co., now known as 3M. Bol said that in fall 2008 he was forced out of Global Scholarship Alliance by investors he had invited into the company, who told him, "We need to cut back on resources, and you're the resource we're cutting back on." He was mulling new business ideas, including a hospital in Sri Lanka, when he built the first Little Free Library. Survivors include his wife, the former Susan Hanson of Hudson; two children, Austin Bol of La Crosse, Wisconsin, and Allison Bol of Saint Paul; three brothers; and a sister. The organization has also spawned imitators, including community boxes built to hold basic hygiene products and canned goods and toiletries. Their creation seemed to offer additional proof of what Bol said he was surprised to learn with Little Free Libraries — that while the books were free and the boxes were unguarded, open to anyone at any time, there was hardly any vandalism or theft.